Book your Rockstar party today! Have you ever heard of any mobile spa parties near me Houston TX? All throughout the city, there are events going on that are the talk of the town. Yet not so many words have been spoken about the wondrous new concept known as a mobile spa. It’s a kind of experience that could only be had in the modern era. Earlier in history, people did not have the resources to bring such a luxury to children on the go. In fact, up until recently an idea of this nature was not as affordable nor accessible. People simply haven’t had the time to adjust to the modern world. However, we have gotten a chance to get ahead of the curb. That’s not a pun, even though we will drive right to your home and park on your curb to host the party. Simply put, Rockstar Spa Bus offers an experience that sets itself apart. 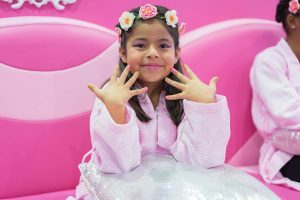 We can host a mobile spa party for girls all ages. Contact us to schedule your celebration now, enjoy a revolutionary take on such a traditional past time! From the dawn of time, hygiene has been the pinnacle of self-care and leisure. Historically, leisure is something that was only available to the uber rich. It meant that you were so secure in your wealth that you yourself didn’t have to work. Others may have and that was where the dissonance in society arose. For those that did have time, they wanted nothing less but the most enticing and remarkable experiences possible. In early societies, this was generally done so by ensuring great hygiene. If you were clean and didn’t smell like manure, chances are you were a noble or of royal blood. Of course, nowadays we have grown to such high levels of wealth that we can provide a basic level of hygiene to a majority of the population. Yet that doesn’t mean the urge to be cleansed and pampered has left the minds of the wealthy. Even today, a spa treatment is considered a lavish way to spend your day and something that isn’t done very often — if at all. Just as people of the old world might’ve thought a spa was extravagant and exotic, it still is today. It’s expensive and reserved only for people who truly live leisure filled lives. Today people of all classes are able to explore these treats. However, one of the few groups of people who are still unable to dive so deep into leisure or relaxation is children. This is because the costs of a regular spa are still too high to offer it to anyone outside of yourself or your partner. Usually, people can’t spend so much on such a luxury. For centuries all the way up to today, children have been kept out of this loop. Fortunately, that is not the truth now. There are options that are offered which can provide kids with those once untouchable luxuries. Rockstar Spa bus is a part of that selection and we make sure to dive deep into this concept. We firmly believe that hygiene and self-care are at the roots of self-esteem and confidence which make up the foundation of wealth. In today’s society, it’s important to teach people to feel as good about themselves as possible. Before this great modern era, you could only feel this confident if you were born into the royal family, otherwise, they ensured you felt lesser. 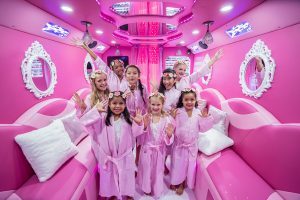 Our mobile spa has the ability to bring the most luxurious atmosphere to children. Yet we can still make it fun and exciting. Everybody deserves to feel this awesome! Our goal is to spoil the kids and pamper them because they deserve to be. Being able to drive to you, and give girls and boys a spa treatment of exceptional quality is something that seems like its from the future. That’s because it very much is! When you finally get down to the core of our packages it revolves around the perfect makeover experience. From the pink walls and the zebra print sofas, right down to the vanity mirrors. We design everything to appear like the perfect princess paradise. As your daughter and her friends enter the bus, they might walk in upon a red carpet with spa robes waiting. When they enter, they could also receive manicures and pedicures with makeup tutorials to follow. Who knows, depending on the package you select they could even be given props and accessories to play with like wigs and the stick-on glitter tattoos. Her nails can be done and they can even get foot massages and icy cucumber facials! All of these options are up for selection with our packages. We have also installed TVs and surround sound systems into the bus that come complete with karaoke equipment and youtube already built-in. Rockstar does its best to create the most thrilling experience for the special birthday girl and all her friends. We want to uphold the luxury of a traditional spa but stay young and innocent, keeping the atmosphere bright and glowing. Although, maybe that’s just from all of the laser lights inside the bus! Contact Us For Your Next Birthday! We are the best mobile spa bus in Houston Texas for a number of reasons. First of all, our pedicure machines are state-of-the-art. They come with features that other mobile spas don’t offer (pipeless whirlpool makers, a shower sprayer and stainless steel foot base just to name a few options). Furthermore, we can offer this service for a fraction of the price that real spas are offering such treatments and services. Rockstar hosts the best spa parties for girls. Our kids’ spa party is second to none! Not only that, but we can even drive to you anywhere in the Houston area. Let us know if you like what you’re reading and want to find out more. You can set up an appointment or simply call us at 1-844-GIRL-SPA (4475-772). Otherwise just visit our website. We are happy to bring this luxury to your front door and celebrate your child’s special day! Residents in Houston eat out more times a week than in any other city in America. Houston has one of the best culinary scenes in the country. It is home to the largest medical center in the world. It is the fourth most populous city in the nation. For more info about Houston click here!